Backspace does not erase: A very good year for Adler Favorit 2's? A very good year for Adler Favorit 2's? When adding my Favorit 2 to The Database, noticed that pretty much all of the Favorit 2's were dated to 1948. Low numbers to do statistics of course, but even amongst this plot of all types of Adler machines, the peak for '48 is noticeable (click image to zoom). The Favorit 2 model was supposedly produced from '37 or '38 to '52, so doubly curious - was '48 somehow a peak-year for portable thrust-action typewriters? A single pool of serial numbers is used for all Adler machines, standards and portables of all types up to about 1950. Taking the difference in starting value per year gives a 'block-size' maximum for machines produced for that year. Plotting these numbers in a bar-chart gives a visual overview of the Adler annual production. Wasn't all that certain if the numbers were start-with or up-to numbers for the year. Plotting both cases in a graph makes it plausible/confirms that the numbers should be read as 'up-to' for a given year. The dip in block-size for '14-'18 suggests that the block-size is indeed a proxy for annual production volume. This also confirms that 'up-to' is the correct reading. The Great War started late '14 and wouldn't have affected production much at the start. Likewise it is unlikely that a large numbering block would be reserved for '17, more likely for '18 (or later even). Much more noticeable in a graph than in a list is the drop from about 1940 to 'no-data' (zero?) when Adler was converted from typewriters to war production. Also here the 'up-to' interpretation makes more sense than the 'start-with' scenario. Same as in the histogram of galleries in The Database, the year 1948 stands out rather. In reading all this, it should be taken into account that all these numbers are only approximate. Like Ted pointed out to me on this; these Adler numbers are not factory ledgers but rather age-lists compiled for dealers in machines. Once every so often, the trade organization would enquire at the distributor what serials they were at. This makes the nice round numbers understandable ("Oh, we shipped machines up to 240,000 last year") and underlines that these are not exact per year really. The lists enable saying a machine was made around-about approximately 1936 for example, but not reliably if it was a '36 or a '37 machine. All that being said, the graph does show that the serial number list is at least a bit of a proxy for production volumes. Another item that stands out in the graph is a 'zero' anomaly for 1924/1923. This could be an error somewhere in the process of compiling such lists, it could also be from the economic upheaval during the second half or '23. Hyperinflation really got out of hand during the fall of '23. The block for '23 being about double the expected size with '24 being zero however makes the most plausible explanation an error somewhere. Perhaps with the economy in tatters, the list compilers didn't update the lists that year. 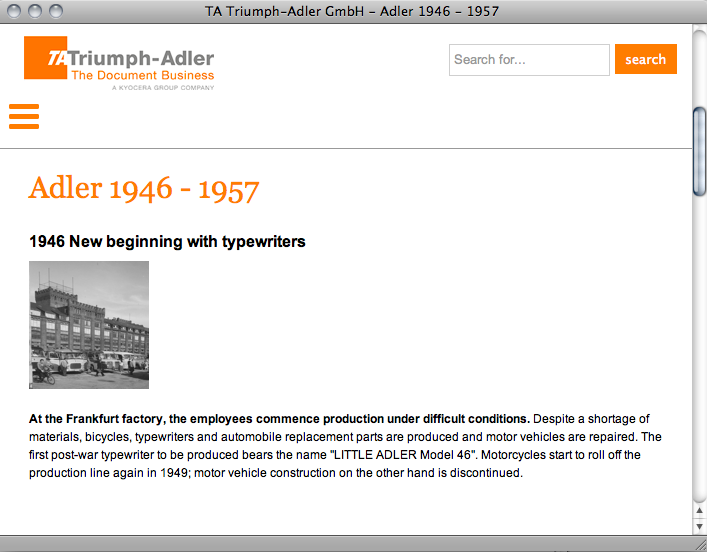 Then also looking again at the '48 and '49 peaks; the current Triumph-Adler website states that production was re-started in '46 with the small portable. Given that the factory (much of the country) was rubble, this would have been low numbers to start with. Also it is plausible that the dealer organizations enquiries on updating age lists didn't start for a while - not until, say, '48 perhaps. From all this, the block for '48 could be re-interpreted as the cumulative ramp-up of production from '46 to '48. The numbers after '50 and certainly after '59 are unlikely a good proxy for production volumes. Other models start to muddle the general numbering. Specific models' numbering ranges match with the general numbering on the whole, but not always or exactly. 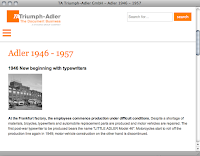 Around '57 Adler merged with Triumph, having cooperated on typewriters already for a long time. Around '59 Adler had taken over Gossen and kept its numbering, with their own serials jumping to 800,000. So only looking at the list up to '50. With all of the above, a couple of small tweaks to the serial numbers suggest themselves. A split of the '23 block over '23 and '24 is the more likely actual production date for serial numbers. Similarly the '48 block of serials is more likely to include '46 and '47 production serials, likely a ramping up in volume towards the volume of '49 and 'Wirtschaftswunder'. The shaded columns contain the new, estimated serial numbers in bold. The annual block plot with these tweaked, newly estimated serial numbers evens the volumes out a little. Only a little though, it still is all approximate. The '29 peak is a bit odd (optimism before the crash? ), as is the '18 number (clean slate, start new range maybe). Coming back to the original observation of '48 being a remarkable year for Favorit 2 typewriters - it was. To be fair there are still too few datapoints to really confidently update agelist data. Nevertheless the tweaked numbers are probably a closer approximation of the Adler serials than the original printed agelists. This really shows what great a resource The Database is! The galleries really add to the serial number lists. With enough galleries added it is becoming a resource that can enable adjusting/compiling agelists of itself. It's research such as this which is of inherently the most value, allowing us to understand the truth of the past. Good work! History is fascinating, even (or perhaps especially) this rather mundane industrial small history. Of perhaps greater importance is that each bit of intense and well-considered research takes us a bit closer to the goal of having *as accurate as possible without actual factory floor tally sheets* age lists, and might spark ideas in other researchers minds or encourage more people to upload Adlers for the data pool. Oh, another fun idea: add Olympia and other German manufacturers to the graph and see if they peak and crash similarly..